Newspapers went all out today to billboard the arrest of the goofball governor of Illinois, ginning up elaborate graphics and coining clever (but not always coherent) headlines. However, the traditional front-page treatment was the most effective in the state where Lincoln is feared to be rolling over in his grave. Breaking out the wood, btw, is an expression from the days when newspapers were composed with hot type. The fonts used in headlines larger than 120 points (a bit less than two inches) generally were carved out wood, because lead type would be too heavy to lug around. When a big story called for a big headline, editors would say they were going to break out the wood. Beyond cosmetics, the other remarkable feature of the coverage at the Register Star was a jumbo graphic smack in the middle of the front page featuring the governor’s autograph scrawled across the editorial the newspaper ran to endorse him when he first ran for governor in 2002. “Dear Wally, I won’t let you down” said a hand-written note accompanying the autograph. According to the newspaper, the note was sent to editorial page chief Wally Haas shortly after it originally ran. 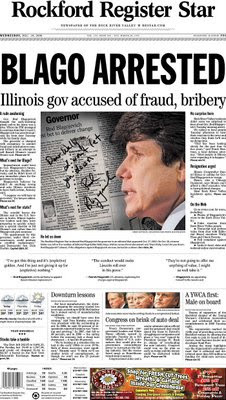 In publishing the autographed editorial, the newspaper not only captured the bitter irony of the governor’s downfall but also owned up to its modest role it putting Blago into office in the first place. This sort of transparency for a newspaper is as refreshing as it is rare. It’s also the sort of thing that lets a paper stand tall in a community, even when it took a position that it wishes it could take back. Looks like the rest of the Illinois crime family, in particular the Barry Blago-Rezko-Soros-Obama member, is in for some tough sledding. Now that the prosecutor has some flippers on the stove, the dam is likely to break. I would bet if the prosecutor re-empaneled the Libby grand jury, he could find out who was lying real quick. The Obama lies about not talking to Blagojevich are already starting to unravel. Read the actual indictment, plenty of juicy clues lurking. Can Tribune Co. survive bankruptcy?